For common EPUB, MOBI and PRC ebook formats, download and install the software fbreader from http://fbreader.org. 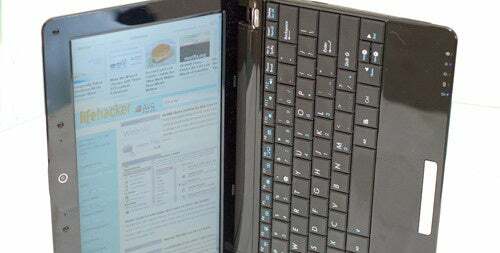 This software is the only ebook reader that I know of that can rotate the text of the book by 90 degrees so that the netbook's screen now emulates the page of a book. However, it cannot handle HTM or PDF documents at the moment. For PDF ebook format, download and install the Adobe Reader XI from http://get.adobe.com/reader/. It has an option for rotating the screen. There you have it. By downloading and installing these two softwares, you can turn your netbook into a ebook reader.